The first quarter of the year will be done in about a half-hour! (I know, how’d that happen?) So I’m curious to see how I’ve done on my Crazy 2012 Reading Plans. Not too bad. I’d like to be a lot further on my Reading Plan, but my grand total is 52 books, which is pretty good for one-fourth of the year. I’ve written 40 reviews so far this year, which explains why I’m still behind. I will definitely have to be more willing to skip reviewing some books. This weekend, I was trying to participate in Bloggiesta, but alas! I was feeling really dizzy, so I slept late and took a long nap. I did get three reviews written, Frankenstein and a nonfiction book finished, posted this, posted a review, posted a Sonderquotes entry, made supper, and played a game of Dominion with my son. But now I need to get to bed and hope I’ll have a little more time for it tomorrow. Oh, I also tried to upgrade the blogs, but first I have to upgrade my data bases, and Yahoo (my host) kept giving an error when I tried to do that. I will try again some time this week (when I don’t mind the site being down for awhile) and send them an e-mail if I keep running into trouble. And I did attend today’s Twitter Party before I got too tired and took a nap. I have done a total of 4 comments, so I will have to get really busy tomorrow if I want to complete that mini-challenge. But, remember: This is all for FUN! So no pressure! I will see what I can do! Alfred A. Knopf, New York, 2012. 315 pages. August Pullman has never been to school before. Not because he has a disability, but because he’s always been recovering from one surgery or another to attempt to fix his face. It was always easier to homeschool him. So now he’s starting fifth grade at Beecher Prep Middle School, and he doesn’t quite know what to expect. Auggie doesn’t actually tell us how he looks. He says that however you imagine it, he looks worse. He knows the looks people give him. He’s used to the averted eyes and people trying not to stare, but going to school makes it all new. “Being at school was awful in the beginning. Every new class I had was like a new chance for kids to ‘not stare’ at me. They would sneak peeks at me from behind their notebooks or when they thought I wasn’t looking. They would take the longest way around me to avoid bumping into me in any way, like I had some germ they could catch, like my face was contagious. The book gets yet more interesting about 80 pages in, when the author starts giving us sections from other people’s perspectives. Auggie’s sister. Various friends and acquaintances. We see some of the same events through new eyes, but we also see new events unfold around Auggie. When the book starts, Auggie seems very realistically overprotected. He’s always been homeschooled, and with his birth defects, his parents, especially his Mom, have always been protective of him. He still displays his love of all things Star Wars, and he cries easily. The growing up process is not easy, but we see Auggie make some strides. This book covers the whole school year, with lots of interactions and events that happen because of Auggie. There’s plenty of Middle School humor; these feel like genuine fifth-graders, and there’s lots to make kids laugh. But the book also strikes deep, making the reader think: How much do I judge by appearances? I think this book is going to be a contender for next year’s Newbery Medal. At the last minute, it’s turned out that I have a couple days I can give to this year’s Bloggiesta! Bloggiesta is hosted at Suey’s blog It’s All About Books and Danielle’s blog There’s a Book. I found out about this year’s event from reading Chachic’s Book Nook. It turned out nice. I do have the full weekend off. On Monday this week, I learned that my son had been accepted to Boston University. So I asked for next Monday and Tuesday off to do a crazy quick road trip up to Boston. Then he got the acceptance notice with a financial aid offer — and a list of tuition prices. He also got accepted to William & Mary. It was easy to notice that Boston University with financial aid would cost the same as William & Mary without financial aid. So I’m no longer interested in trying to get him more interested in Boston. He seems happy to think of going to William & Mary, so I’m happy too! But — I did ask for those two days off. And when I realize that my son will be at home those two days (and the rest of the week at his Dad’s), it seems like a good idea to still take them off. Then I discovered that Bloggiesta is this weekend! So what that means… I can spend all day Saturday and most of Sunday doing Bloggiesta, and put off my weekend chores and errands for Monday and Tuesday. Sounds like a lovely way to put fun ahead of work! 1. *** Catch up on writing reviews!!! 2. Update the wordpress version of my blogs. This one’s just a detail — usually. Sometimes it hits a bump and takes a long time. So I’ve been putting it off. 3. Attend a Twitter party! I just caught the end of the first #bloggiesta Twitter party. I will try to attend the one tomorrow from 4 to 6. 4. Post one post on each of my blogs each day, and one review. I have four blogs, for different things. http://sonderbooks.com/blog/ is my main blog, and all the reviews are permanently posted on my website, sonderbooks.com The catch with having an html website and a blog is that it takes longer to update both and set up the links. This is why I’ve begun writing the reviews ahead, and then posting them later. My Sonderquotes blog is just to post good quotations from books I’m reading. My Sonderblessings blog is a personal blog to remind me to be thankful for all the good things in my life. I just count my blessings. And finally, my Sonderjourneys blog is supposed to be a link about places I’ve been and what’s going on in my life. But I stopped in the middle of my last vacation and last posted at Christmas, so I do need to give it some updates. 5. Do the commenting mini-challenge! That’s hosted by Book Journey. I’ll have to do some work to find 20 blogs to comment on. Definitely fun work! 6. Look over plug-ins for my blogs. That’s hosted at Jenni Elyse’s blog. 7. Add some more social media icons. That mini-challenge is posted at Adventures of 2.0. 8. Look at my subscription page and see if I can switch it to e-mail subscription. I’ve been meaning to do this since KidLitCon last September. 9. Finally, if I get the chance, look at the mini-challenge at Janicu’s Book Blog to link my blog to my neglected-no-longer(?) GoodReads account. Whew! Did I mention that I know this list isn’t actually doable in only two days? And the big priority is to cut down on my to-be-reviewed stacks. So I will try to spend time writing reviews before I do any of the challenges. But it does sound like a lot more fun than cleaning my house! Minotaur Books, New York, 2011. 335 pages. Here’s a second mystery set during the dawn of democracy in Athens. In this one, our hero Nicolaos is sent to Ephesus in Ionia to retrieve a letter stolen from a murdered man. The proxenos for Ephesus in Athens (kind of the opposite of an ambassador; an Athenian with an interest in Ephesus who handles Ephesian business) has been murdered. A letter he received from Ephesus has been stolen. Nico has to go to Ephesus with a mission to find out what was in the letter. The murdered man’s son would like his father cleared of treason while Nico’s at it. And the woman he loves, Diotima, is now a priestess at the Artemsion in Ephesus. This is no cozy armchair mystery. There are some gritty details and some sexual misadventures, but they do seem to reflect life in that time period. I had known, for example, that impalement was used to kill people, but I’d never before understood what a truly horrible form of death it was. The author explains in his note at the end that crucifixion was introduced later as a more humane alternative to impalement. Nicolaos travels to Ephesus and Magnesia, where he meets the famed hero of Athens, Themistocles, who was later exiled as a traitor and now enjoys the favor of the Great King of Persia. There’s another death, and Nico has to figure out how they all tie together, as well as fulfill his commission from Pericles in Athens. The mystery is the sort where you don’t necessarily have the clues to solve the case yourself, but you do enjoy the adventure of watching Nicolaos come to the solution, with lots of help from Diotima. All in all, despite some moments that made me wince, this book gives a fun story, an adventure with lots of historical details and a strong dose of humor. Nicolaos is something of a bumbler. The more pleased he is with himself, the more confident he is, the more you can be sure he’s going to fail. Since Nico’s visiting Persia, he naturally looks at their lives with the eyes of an Athenian. This makes an entertaining way of telling the reader the things that were normal in Athens. For example, one character convinces Nico that wearing trousers is a more comfortable way to ride a horse. Reading the extended author’s note at the end of the book made me all the more impressed with it. Based on the historical record, everything in this book could actually have happened. As in the first book, The Pericles Commission, the list of characters at the front highlights people who are actual historical figures, about half of the list. My favorite, of course, is still Nicolaos’ annoying little brother, Socrates, though he only shows up at the start of this book. If you read these books, you’ll never think of ancient history the same way again. The Athenian proxenos for Ephesus is murdered. Nicolaos goes to Ephesus to investigate. Highjinks ensue. Now I know what really happened. Well, today the last of my three favorite books in School Library Journal’s Battle of the Kids’ Books was knocked out. To review, those three favorites, probably in this order, were: Okay for Now, Daughter of Smoke and Bone, and Chime. Though I’m plenty fickle, because in her brilliant analysis, E. Lockhart got me completely behind her choice of Chime over Daughter. Now, in a side note, didn’t I tell you that authors tend to pick the book least like the one they’d write themselves? So, once I thought about it, I wasn’t really surprised Maggie Stiefvater didn’t move Chime along. And let’s just say that I loved her book, The Scorpio Races, more than either Chime or Daughter of Smoke and Bone. But that’s the way these things go. The fun is not in having my own choices vindicated (They usually aren’t. ); the fun is in reading brilliant authors talking about reading brilliant books. Now, I said last week that I was pretty sure I would choose any book in the first half over any book in the second half. But now that I know the books that have won, I actually think I would pick Drawing from Memory over Between Shades of Gray. DfM is growing on me as I read the judges’ comments, and it really is a brilliant book. And, let’s face it, Between Shades of Gray is much more depressing. What’s that you say? Drawing from Memory is up against Life: An Exploded Diagram tomorrow and may not even make it to the Final Round? I am not even going to consider that possibility! It would be too wrong. But all this is a moot point, and here’s why: I want the Zombie to win! You see, every year since the second, the fun thing about SLJ’s BoB is that they hold an Undead Poll before the Battle begins. Fans vote for their favorite book to come back from the dead and compete in the final round, if it got knocked out sooner. This year, I voted for Okay for Now, but I would be very happy if any one of my top three favorites was the winner. I think my chances of one of these three being the winner are very good. — They were all three popular books. And this is cool because now they don’t have to compete against each other, so I can wholeheartedly root for the Zombie to win. It’s Sonderling Sunday again! “Nerd Sonntag,” where I play with language by looking at German translations of bizarre English words and phrases as found in James Kennedy’s The Order of Odd-Fish. Last time, I left off on page 16 of The Order of Odd-Fish, and page 25 of Der Orden der Seltsamen Sonderlinge. Jo’s bathroom, like everything else at Lily Larouche’s palace, was a gilded wreck of red and gold marble, kaleidoscopic mirrors, and frenzied geometric mosaics, dimly lit by dozens of spicy smoking candles sprouting from a brass chandelier so mammoth and ornate it seemed like a fiery flying city. Jo lay soaking in the ivory bathtub, the silence broken only by the distant chatter of the television, and thought about Aunt Lily. Jos Badezimmer war, wie alles andere in Lily Larouches Palast auch, ein vergoldetes Wrack aus rotem und goldenem Marmor, kaleidoskopartigen Spiegeln und verrückten geometrischen Mosaiken. Dutzende Duftkerzen tauchten alles in ein dämmriges Licht. Sie brannten in einem Messinglüster, der so riesig und so von Ornamenten überladen war, dass er wie eine gewaltige fliegende Stadt wirkte. Jo lag in der Badewanne aus Elfenbein. Die stille wurde nur von dem fernen Geplärr des Fernsehgerätes und ihren Gedanken an Tante Lily gestört. Note: I’m going to use Google translate to get at more literal translations of the German, to get at the roots of what’s being communicated here. Es war fast Zeit für Jo, zur Arbeit zu gehen. Sie stieg aus ihrem Bad, trocknete sich ab und zog ihre Kellnerinnen-Uniform an: ein pinkfarbenes kratziges Polyesterkleid, das ihr nicht wirklich passte. Dann ging sie nach oben und sah nach Oberst Korsakov. It was almost time for Jo to go to work. She got out of her bath, dried off, and changed into her waitress uniform — a pink, itchy polyester dress that didn’t really fit — and went to check on Colonel Korsakov. Wait a minute! Before “pink” was rosa, and now it’s just pink? Hmm. Maybe German is giving us different shades of pink? I love “itchy” = kratziges Doesn’t that just sound itchy? “Jo hesitated, then cautiously tiptoed into the darkened room.” = Jo zögerte, öffnete die Tür und schlich auf Zehenspitzen behutsam in den dunklen Raum. Korsakov lay on the sagging bed, snoring and snorting, his stomach heaving under his pajamas like an unsteady mountain of jelly. Jo stared in a kind of awe. Korsakov was somehow even more colossal than she remembered — like an exuberantly portly walrus. Der Russe lag auf dem Bett, dessen Matratze durchhing, und schnarchte aus Leibeskräften. Sein Bauch hob sich in dem Pyjama wie ein wabbelnder Berg aus Gelatine. Jo starrte ihn fast ehrfürchtig an. Korsakov war noch kolossaler, als sie ihn in Erinnerung hatte, er schaute aus wie ein ausgesprochen korpulentes Walross. “The dirty rag!” = Dieses schmutzige Schmierblatt! Eine gigantische Kakerlake hatten den Raum betreten. Sie war mindestens einen Meter fünfzig gro?, trug einen violetten Samtanzug, darunter ein Seidenhemd, eine Krawatte und einen Bowler auf dem Kopf. Im Knopfloch steckte eine grüne Nelke. Die Kakerlake hielt mit vier Armen eine Zeitung, die sie durch ein Monokel studierte. Jo wich zurück, aber das Insekt nahm sie kaum war. A giant cockroach had walked into the room, three feet tall, wearing a purple velvet suit with a silk shirt, cravat, and bowler hat. A green carnation was fixed in its buttonhole. The cockroach clutched a newspaper with four arms, reading it through a monocle. Jo backed away, but the insect barely acknowledged her. I think this is funny. The translator is very literal with the translation of “three feet tall,” using einen Meter fünfzig gro?, using “one meter, fifty centimeters” instead of just saying about a meter. And wait a minute, a meter is slightly more than three feet, not fifty centimeters less. What’s up with that? Dear Eldritch Snitch. I slap you with the satin glove of righteous wrath! From what noxious nest of nattering nincompoopery do you release your rancorous roosters of rumor . . .
Liebe Schauerliche Petze! Ich ohrfeige Euch mit dem Seidenhandschuh rechtschaffenen Zorns! Aus welchem verderbten Nest schwatzhafter Einfaltspinsel Ihr Eure boshaften, aufgeblasenen Gerüchte . . .
“Jo had just about had enough.” = Jetzt hatte Jo die Nase endgültig voll. (“Now Jo’s nose was finally full.”) Love it! “You’re never so happy as when you have a nice fresh bullet lodged in your belly.” = Sie sind nur dann glücklich, wenn Sie eine hübsche neue Kugel in Ihrem Wanst haben. “You deliberately enrage armed lunatics!” = Sie ermutigen diese bewaffeneten Verrückten doch absichtlich! “Boiling Brezhnevs!” = Brodelnde Breschnews! “I once gallivanted” = Einmal habe ich mich sogar herumgetrieben. “in a small voice” = klang kläglich (“rang miserably”) Nice and alliterative. Okay, I got through the rest of Chapter Two! Perhaps I can make progress after all…. Now that I know more of the words, I’m pausing to translate only the most interesting. But they still haven’t gotten to Eldritch City, so I know there will be many more interesting phrases to come! And I hope I’ve intrigued some readers into reading the inimitable book The Order of Odd-Fish in order to find out the context of some of these phrases! Enjoy! Battle of the Books Round Two! As of today, Round One of School Library Journal’s Battle of the Kids’ Books is complete, and today things really heated up! You can tell from the comments, I wasn’t the only one disappointed when Okay for Now was knocked out today. As far as predicting went, I was feeling cocky when my first five predictions won. Then, alas, my next three lost, so my top bracket looks like I wanted it to (except for the awful fact of two favorites competing against each other next round), but the bottom half is full of books I’m just not as crazy about, especially since the one I got right in the bottom half wasn’t a big favorite, anyway. But I’m now ready to talk about how I’d like the rest of the Battle to go. Will I get my way? Probably not. I usually don’t. But I’m sure that there will be some eloquent explanations made, even when I think the judges are woefully misguided. For this one, I’m definitely rooting for Between Shades of Gray. Because it made me forget it wasn’t nonfiction, but also caught me up in the plight of the characters. Now, the judge for this contest is Marc Aronson, who writes excellent Children’s Nonfiction himself. Will that bias him toward picking Amelia Lost? Well, I’m going to go with my old tried and true guess that judges usually pick the book least like the ones they write. Though I strongly suspect Marc Aronson might be an exception to that rule, since the one I really want to win is Between Shades of Gray, I’ll stick with that choice as my prediction. I want whichever book wins Round Two, Match Two to defeat whichever book wins Round Two, Match One. Because I like both Chime and Daughter of Smoke and Bone better than Between Shades of Gray or Amelia Lost. I definitely want Drawing from Memory to win. I definitely want Wonderstruck to win. I don’t think I need to go over again the things I didn’t like about Life and Inside Out and Back Again. I read all four and only chose to review two. You can read those reviews to see the things I liked about the two I reviewed. If my predictions are right, and this is Drawing from Memory vs. Wonderstruck, I would be torn, but I think I’d want Drawing from Memory to win. If either of those books loses in Round Two, I want the other to win Round Three. If both of them lose Round Two, I would probably pick Life over Inside Out and Back Again, but wouldn’t feel strongly about that choice, because I’d want them to lose the next round! Okay, I’m really hoping that Okay for Now wins the Undead Poll. If not, then whichever book loses Round Two, Match Two. Not considering the Undead, I want whichever book wins Round Three, Match One to defeat whichever book wins Round Three, Match Two. Except maaaaaaybe if it were Amelia Lost vs. Drawing from Memory. In my Sonderbooks Stand-outs, I ranked Drawing from Memory just higher, and I should really stand by that. Now, throwing the Undead winner in there could change it. I’ll post again after the Undead winner is announced. In general, my top three books in the tournament are Okay for Now, Daughter of Smoke and Bone, and Chime probably-but-not-necessarily-definitely in that order. So if Okay for Now does win the Undead Poll, I want it to win. Otherwise, I’ll go with the winner of the top half. If we end up with Daughter of Smoke and Bone vs. Chime, I’ll have to go with the opinion expressed above, with Daughter edging out Chime. Clear as fog? You know I won’t be able to resist further comments as the tournament continues. I am pleased with the set of books left after the first round. And whatever happens, it’s going to be entertaining! Scholastic Press, New York, 2011. 637 pages. Brian Selznick did something amazing with The Invention of Hugo Cabret, telling half the story with pictures. The pictures were so excellent, he won the Caldecott Medal for his work. Now, with Wonderstruck, Brian Selznick has created another work that will fill readers with wonder. The form is very similar to Hugo Cabret, but the book has a logic and beauty of its own. In both books, the writing didn’t draw me in, didn’t make me feel for the characters as much as I wanted to. However, Wonderstruck pulled me in anyway with the characters. Where, to me personally, Hugo Cabret felt like a clever puzzle, Wonderstruck is a brilliant puzzle wrapped up in a heart-warming story and fascinating historical details. In Hugo Cabret, the detailed pictures evoked the silent films the story was about. In Wonderstruck, we’ve got two separate stories going on. The written narrative is set in 1977, beginning in Gunflint Lake, Minnesota, and the story told through the pictures is set in 1927, beginning in Hoboken, New Jersey. The story in 1927 is about a deaf girl, so silent pictures, like the silent movies she loves, are appropriate for her story. The two stories converge in New York City at the end of the book. The author’s Acknowledgements at the end reveal the vast amount of research he did and his incredible attention to historical detail. This book is an amazing work of art in the way he wove together words and pictures, but also two separate stories into one. He even makes the pacing the same as he tells the stories. When one child is running away, so does the other. When one child is discovering things, so does the other. I do love having Brian Selznick’s books there to offer to children. They look like a big, daunting book — but with all the pictures, can be read quite quickly. So even reluctant readers can read an “Award Winner” and thoroughly enjoy it. Candlewick Press, 2011. 105 pages. This is a novel about a thirteen-year-old boy named Conor whose mother is dealing with cancer. His father recently left them, so they live alone. At least for as long as his grandma stays away. At school, Conor has to deal with bullying. He acts out at times, and everyone, teachers and kids, tiptoes around him because of what is happening with his mother. The monster comes over and over again. No one else can see the monster. But it leaves yew leaves in Conor’s room. It damages Conor’s house. The monster tells him three tales. Three tales that Conor doesn’t like. Three tales that pack a punch. When those are done, what is the truth that Conor needs to tell, and will he have the strength to tell it? The illustrations in this book are atmospheric and creepy, pulling the reader into the dark, sinister setting. Everything about this book works. However, let me just say that if you’re a recently divorced mother living with your teenage son and you’re experiencing strange medical symptoms, this book is not a good choice. This fact makes me think the book might not be a great choice for someone whose mother actually has cancer. It’s great for building empathy in kids who are not going through something similar right now, but it might be too discouraging if the situation feels at all like it’s matching life. Let’s just say the outcome for the mother is not good. For me, I had a stroke last July, and thought I’d come off very lucky, with no permanent disability and the stroke never touching my higher thinking. Then in October, I had a weird setback, feeling like I did right after the stroke again. After another setback, I saw the neurologist. He wasn’t very impressed by my low-grade dizziness and feeling “funny,” but then he did a neurological exam. When he saw I was seeing double if I looked up and to the right (my left eye not tracking with my right eye), he told me I’d probably had another stroke! This was December 23rd. He told me to get an MRI done the next week and see him the week after that. I tried to make an appointment to see him, and they gave me January 25th. Now, I’d been laboring under the belief that the fact I was on Coumadin would keep me from having a second stroke. After this appointment, I had some days off because of Christmas. After Christmas, at work I noticed that now I was seeing double if I looked up and to the left. I called the neurologist’s office and they told me to go to the ER, but the ER didn’t find anything new wrong. I had more days off for New Year’s and felt awful but just wasn’t sure what the symptoms meant. So, all this is to say: This book is outstanding. It’s atmospheric, powerful, well-written and hard-hitting. But be careful when you read it. Balzer & Bray, 2011. 108 pages. Kadir Nelson’s paintings, as usual, are stunningly beautiful in this book. His use of light makes the people seem warm and alive. 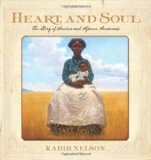 The words alone of this book make a grand, sweeping story of African-American contributions to American life, but combined with the paintings, this book has majesty. Kadir Nelson’s art continues to be breathtaking. He shows you the dignity and beauty of his subjects. 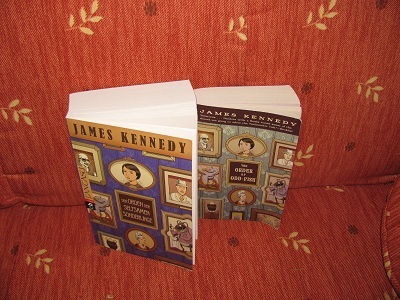 You are currently browsing the Sonderbooks blog archives for March, 2012.